Solar Water Heating Without Replacing Your Tank! Some people have a strange love affair with their electric tank water heater. It’s true. When you tell people that you want to replace their water heater when you add a solar water heating system, they get a little misty-eyed, or even a bit angry. That’s okay – we can get you solar water heating and not throw your baby out with the bath water (pun intended)! 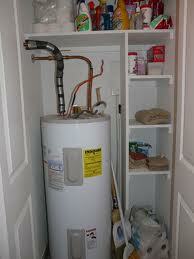 Most traditional tank water heaters we see in Florida are pretty small – 40-60 gallons. This is different than our friends up north for a few reasons. We don’t need to store lots of hot water because the ground water is generally warm already, so the electric tank does not take too long to recover when you draw it down. We also don’t have basements, so space in the living area of our homes is limited, and why take up extra space if not required. Alas, most homes in Southwest Florida simply don’t have the room for a larger tank, much less a second tank. Water heaters are often found in closets or in garages whee storage space is precious, or in attics where weight is an issue. Let me explain why we want to replace your tank… Ideally we would install an 80 gallon tank in a typical residence. The reason for this is to store as much solar heated water as possible. It takes a little longer to recover your water temperature with a solar water heater, and solar water heating is not possible at night or on poor weather days. Having extra storage allows us to minimize the usage of the electric backup element. Finally, there are “solar tanks” available that have extra insulation to reduce standby heat loss. If I had it my way, I would leave your beloved tank in place and install a secondary solar pre-heated tank. This is the best setup because the solar tank is only heated with solar water heating. As you use water, the preheated tank flows into the electric backup tank, but the water is already hot, making the electric water heater’s job very easy, or unneeded! In some cases, at some times of year, customers have been know to unplug the electric element altogether, especially in the summer. You experience may vary depending on your water usage habits. The best way to understand if this strategy is good for your family is to discuss you habits and water usage with a solar energy professional. So don’t replace your tank. Your old friend can continue to grace your closet, garage, or attic for the foreseeable future.